I had to read 30 papers on ebola pathogenesis this week. When I was digging my way through paper number 7, I made a flawed observation: reading papers is boring. Most graduate students would agree with that statement, but I want to convince you that calling papers boring is as pointless as saying rocks are stupid. Boredom comes from the mismatch between the way we would like to consume information and the way it is presented. Understanding this difference can make our presentations more interesting and our stories more engaging. Figure 3: Overexpression of Bcl-2 protects lymphocytes from EBOV-induced apoptosis. Vav-bcl–2 mice showed nearly complete protection against lymphocyte apoptosis compared with wild-type littermate control mice (Fig. 3). Vav-bcl–2 transgenic mice, in which Bcl-2 is overexpressed on all cells of hematopoietic origin (20), were a kind gift from Dr. Jerry Adams (Walter and Elisa Hall Institute, Melbourne, Australia). The intrinsic [apoptosis] pathway can be inhibited by overexpression of Bcl-2, which stabilizes the mitochondrial membrane and prevents the release of cytochrome c.
If you combine and expand those four sections with many additional details, you might have a story. It’s kind of weird, but we currently write scientific articles by choosing a few experimental results, splitting them into parts (background, findings, interpretation and technical details), and grouping them into longer sections (Introduction, Results, Discussion and Methods). Then, the readers have to read the entire paper and combine each individual story in their heads. I would love to change the way we write scientific papers to make them easier to read, but that’s not the battle I’m picking today. Instead, I want to focus on how to become a better storyteller by reading papers more efficiently. Identify the pieces that make up the title (and simplify them). It’s easy to miss the meaning of strung-together words unless you dedicate some time to unpack them. List all the research findings mentioned in the abstract (these are useful to determine if the paper is relevant for your research). Skip the Introduction and study the first figure. If you understand it, move on to the next figure. If you don’t, find the paragraph in the Results section that describes it. If you don’t understand something in the paragraph, go back and look it up in the Introduction (or if it points to a reference, read that paper before you continue with the current one). Once you’ve understood all the figures, skim the Discussion for additional insights. Write a summary of everything you found interesting (this is key). Need-to-know reading is a better way of consuming scientific information than traditional reading because it forces you to identify and fix gaps in your understanding before you move on to new ideas. It helps to have the bibliography next to you while you read (most PDF viewers have a “split screen” function, so you can look at two sections of the same document at the same time) and to check out the original references every time you run across something you don’t understand. I like to build a map that shows the path I’m following between papers—it prevents me from getting lost and it helps me decide what I should read next (it also saves me from having to open 40 tabs on my browser). The Bcl2 protein prevents mitochondria from releasing cytochrome c and causing apoptosis. The authors show that mice overexpressing the Bcl2 gene don’t undergo lymphocyte apoptosis during Ebola virus infection. The authors think that three likely explanations are X, Y and Z.
I’m pretty sure that a month from now the only thing I’ll remember from the 30 papers I read this week will be the summaries. 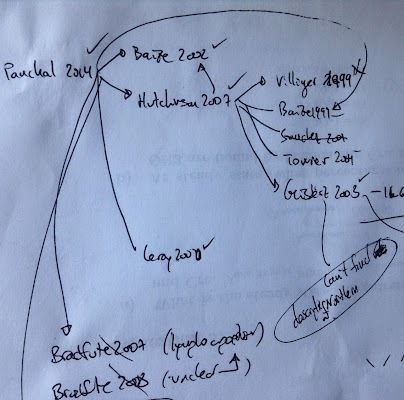 It takes discipline to come up with a summary for each one, but it also makes it easier to connect multiple pieces of research (Bradfute2010 says that Bcl2 was important but Morgan2020 contradicts it), and to discuss my conclusions with other colleagues. Ultimately, the better you get at translating facts into stories, the better you get at presenting. If you’re not reading as many papers as you’d like to, or if you find the experience frustrating, read your next paper on a need-to-know basis, build a map with the references to other articles (so you can decide which ones to read next), and write down a summary of the things you find interesting about each one. Reading something is only useful if you can remember it.